On the 6th August 1918 Egbert Cadbury shot down an enemy Zeppelin L70 over the sea at Great Yarmouth in an act to defend our home town and our country. Martha Taylor and Samuel Smith were the first civilians ever killed in an air raid when Zeppelins attacked Great Yarmouth in 1915. Cadbury had been a pilot since 1915 and shot down an L21 Zeppelin over the North Sea in 1916. 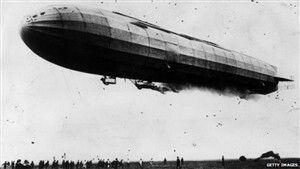 When Zeppelins were sighted again in 1918 Cadbury made a split-second decision that would save our town. He immediately chased after the target in his Airco DH4 Aircraft. With the help of Gunner Robert Leckie, he climbed above the ship by throwing away his spare fuel. Cadbury fired into its stern, setting it alight. To his horror he saw a man in the machine-gun pit run to the other side and leap overboard. The Zeppelin circled down into the sea wrapped in a roaring fire. Cadbury and Leckie were awarded the Distinguished Flying Cross. After the war, Cadbury re-joined the family chocolate business and was knighted in 1957.